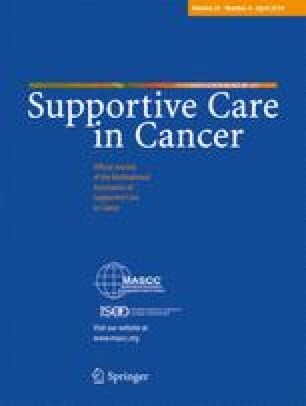 The aims of this study were (1) to evaluate quality of life (QoL), nutritional status and dietary intake taking into account the stage of disease and therapeutic interventions, (2) to determine potential interrelationships, and (3) to quantify the relative contributions of the cancer, nutrition and treatments on QoL. In this prospective cross-sectional study conducted in 271 head and neck, oesophagus, stomach and colorectal cancer patients, the following aspects were evaluated: QoL (EORTC-QLQ C30), nutritional status (percent weight loss over the previous 6 months), usual diet (comprehensive diet history), current diet (24-h recall) and a range of clinical variables. Usual and current intakes differed according to the site of the tumour (P=0.02). Patients with stage III/IV disease showed a significant reduction from their usual energy/protein intake (P=0.001), while their current intakes were lower than in patients with stage I/II disease (P=0.0002). Weight loss was greater in patients with stage III/IV disease than in those with stage I/II disease (P=0.001). Estimates of effect size revealed that QoL function scores were determined in 30% by cancer location, in 20% by nutritional intake, in 30% by weight loss, in 10% by chemotherapy, in 6% by surgery, in 3% by disease duration and in 1% by stage of disease. Likewise in the case of symptom scales, 41% were attributed to cancer location, 22% to stage, 7% to nutritional intake, 7% to disease duration, 4% to surgery, 1% to weight loss and 0.01% to chemotherapy. Finally for single items, 30% were determined by stage, 20% by cancer location, 9% by intake, 4% by surgery, 3% by weight loss, 3% by disease duration and 1% by chemotherapy. Although cancer stage was the major determinant of patients’ QoL globally, there were some diagnoses for which the impact of nutritional deterioration combined with deficiencies in nutritional intake may be more important than the stage of the disease process. Conflict of interest statement: The authors assert that they have no financial or personal relationships with other people or organizations that could inappropriately influence their work. We are indebted to the medical, nursing and technical staff of the Radiotherapy Department of the Hospital of Santa Maria. We express our gratitude to Ms. Pat Howard for the insights and thorough revision of the text. This study was supported by a grant from Fundação para a Ciência e Tecnologia (RUN 437).